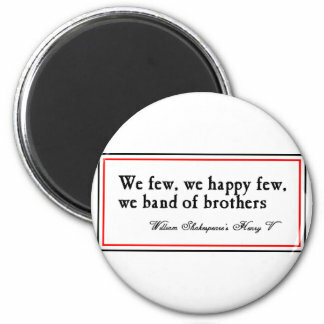 Available for £2.70 from Zazzle. Listed under ‘Band quotes’. All of these elements were present and correct at the RSC, but this is quite clearly the trajectory of Henry V: not Henry V. As the production constantly reminded me, there’s more going on in this play than I realised. I didn’t like the play because I remembered it as jingoistic: a series of vaunting boasts about a futile war of conquest in which the audience is exhorted to celebrate as a national hero a man who cuts the throats of prisoners-of-war and threatens the women of an entire city with ‘hot and forcing violation’ (3.3.104). Though Henry doesn’t directly condone his troops’ sexual violence, he seems content to victim-blame the whole of Harfleur: ‘What is’t to me, when you yourselves are cause…’ (3.3.102). Greg Doran’s production staged this speech almost blankly, with Hassell’s Henry betraying only a slight vocal tremor, and little in the way of staging context: it was left to the audience to make up their minds how this unflinching catalogue of horrors could share cognitive space with the largely idealised King. What the production reminded me is how much this is a play of jarring juxtapositions. This speech, for instance, is directly followed by the scene in which Princess Catherine of France learns English. Played as a moment of comic frippery, it’s nonetheless framed in a context of endemic violence against conquered women, and the brutality of this transition reminds us that the apparent courtly romance might only be the Harfleur speech in finer clothes. Elsewhere, a misogynistic rant breaks the spell of Falstaff’s bucolic death scene, and Pistol segues directly from being beaten over the head by a leek to a melancholy reflection on the vagaries of fortune, the death of a lover (and a much-loved character), and time’s passing: ‘Old do I wax’ (5.1.80). Most relevant to my own research is the moment between the French surrender (‘The day is yours’) and Henry’s acknowledgement of the scores of dead: ‘Bring me just notice of the numbers dead/On both our parts’ (4.7.84-115). Where we might have expected a final paean to English victory by the King, delivered in stirring verse, Captain Fluellen pops up for a prose discourse on Welsh pride and the wearing of leeks: ‘If your majesties is remembered of it, the Welshmen did good service…’ Though not played for outright comedy, Doran used this moment to break the tension on the battle-field of Agincourt: Fluellen’s costuming, reminiscent of the WWI cartoon Old Bill, contributed to this demotic puncturing. Why this flourishing of prosaic Welshness should happen at this point, where a neater history might include a plangent eulogy to ‘our English dead’, says much about the complications and contradictions that could be teased out of this play with audiences and students. How much this production did so, I wasn’t sure. Though making us fully aware that war is hell, the RSC version did little to challenge or question the inflexible nationalism that led to its outbreak – perhaps a missed opportunity, in a performance rich with centenary resonances. The reassignation of Burgundy’s long speech about the destruction wreaked on France to the steely Queen Isabel went some way to redressing this, and it was hard to forget John Bates’s pointed reference to what mostly happens offstage: the loss of ‘many poor men’s lives’ (4.1.121). The final choric reminder that Henry VI ‘lost France’ shows, within the play, a conscience of the cyclical pointlessness of it all, but I’m not convinced Henry V as a whole commits to an awareness of such loss and waste. As such, I didn’t leave the theatre wholly converted: but I was also reminded of the need not to oversimplify or underestimate even those Shakespeare plays we find hard to truly love. — Jake Thackray’s ‘The Remembrance’, the best song I know about the futility of war.